In the final installment of the 2017 Small Business Digital Marketing Survey, Clutch interviewed 350 small business owners and managers to understand their approach to marketing and advertising. As many small businesses increase their investment in digital marketing, Clutch analyzed survey results and interviewed experts to identify key marketing and advertising strategies that can help small businesses succeed. 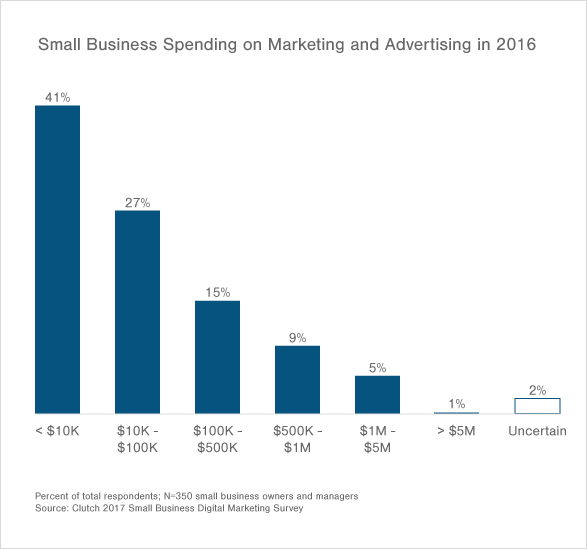 Against a backdrop of post-election optimism, small business owners are planning to increase their marketing and advertising budgets in 2017. With budgets expanding, the age-old question of how to ensure the highest possible return on investment becomes even more critical. 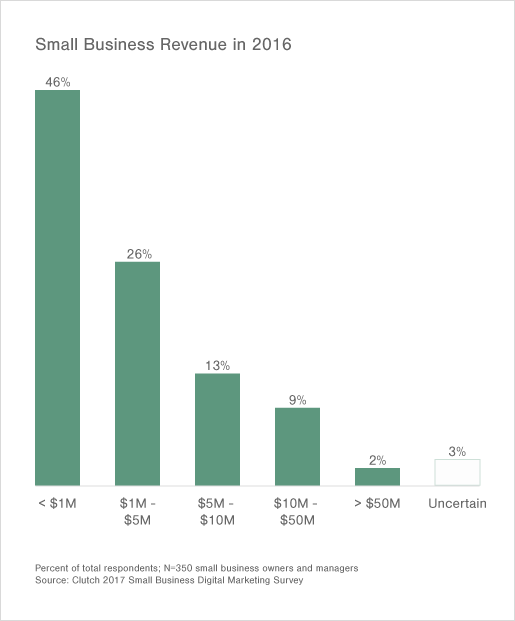 When it comes to determining where to invest, small businesses face decisions at every turn. Should you hire a new teammate who can be devoted to your brand or go with a tried-and-true agency promising targeted results? Is organic reach on social media enough? How important is SEO, anyway? And finally, how much attention should you pay to the year’s hottest trends--augmented reality, virtual reality, and video? Clutch interviewed 350 small- and medium-sized business owners and managers at companies with fewer than 500 employees to understand how they currently think about their marketing and advertising dollars--and how to make the most of every cent. Whether your marketing budget is $10,000 or $1,000,000, Clutch found that best practices come at a wide range of price points and creative solutions that can boost any small business’s competitive edge. Overall, 59% of small businesses anticipate revenue growth, and 49% plan to invest more in marketing and advertising, two factors that convey a sense of optimism. When it comes to setting a marketing budget, it’s important to factor in additional time and funds for experimentation. When it comes to expanding investment in digital marketing, 29% plan to ramp up social media. Its low cost and ability to granularly track ROI make it an ideal area for additional spending. Of small businesses seeking to improve their search ranking, 52% focus on local searches to ensure that local customers come straight to them. With most small businesses having fewer than 10 employees total, it’s rare to have more than one person responsible for marketing. The majority of small businesses (80%) hire at least one agency, and lower cost consulting options exist for small businesses that are still ramping up. Augmented reality, virtual reality, and video are among the next big marketing trends to watch. Small business owners are the heart of our economy, but they face a huge challenge: building a company on their own with a limited budget. By the time she left Pepsi to start her own ecommerce business, Marisa Meddin had experience marketing iconic products such as Diet Pepsi, plus experience with corporate global strategy. As she made the transition from working in a global corporate setting to running her own small business, Meddin has embraced the learning curve. Now, she runs The Dessert Place, shipping gourmet cheesecake brownies across the United States with a staff of two bakers. Meddin’s small team isn’t unusual among small businesses. According to census data, we know that of the seven million businesses currently driving the American economy, 73% have fewer than 10 employees. Clutch’s survey captured companies at a range of development points, from steadily growing teams to freshly launched startups that may only be a founder and one other employee. Clutch defined small businesses as those with 500 or fewer employees, with 40% of respondents reporting that they also had 10 or fewer employees. 27% of small businesses had 11 to 50 employees; 25% of small businesses had 51 to 250 employees, and 8% of small businesses had 251 to 500 employees. When it comes to revenue, most small businesses’ small staffs also correlate with smaller earnings. 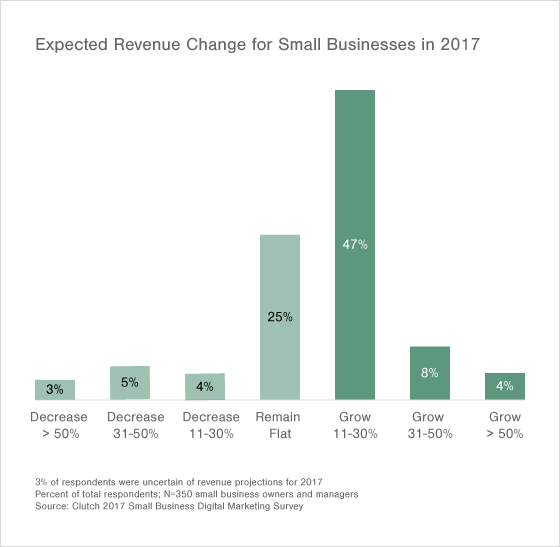 Nearly half (46%) of the small businesses surveyed reported total revenue equaling less than $1 million in 2016, compared to only a quarter (24%) of small businesses that reported over $5 million in revenue. Of the small businesses that reported less than $1 million in revenue, 84% had 10 or fewer employees. Compared to pressing expenses like payroll or inventory, marketing and advertising can feel like creative luxuries. But experts caution against under-investment of time and other resources. Debbie Williams is the co-founder and chief content officer of SPROUT Content, a content marketing agency that specializes in performance content for B2B companies in "unglamorous" industries. Ideally, a marketing strategy should accommodate some experimentation. “It boils down to committing the resources necessary for figuring it out,” said Ryan Buckley, CEO of Scripted, a content marketing agency that matches companies with freelancers and ghostwriters. In figuring out marketing for his own business, Buckley spent six months experimenting before finding one paid ad channel that would work for Scripted. “To a small-business owner who goes through two weeks of trial-and-error, and throws their hands up, I would say that they need to invest more time than that into figuring things out,” said Buckley. A slightly bigger budget longer term strategy takes into account the fact that not everything will go according to plan. Clutch asked small businesses to report their total spending on marketing and advertising in 2016, including both traditional marketing such as broadcast, direct mail, and telemarketing, as well as digital marketing such as a website, SEO, social media, and online advertising. Meddin said that the low figure didn’t surprise her. She pointed out that digital marketing has cut costs and given small businesses the opportunity to simply spend smarter. No matter what marketing strategy is on your wish list for future investment, it’s important to be flexible when budgeting time and funds in order to build in room for experimentation and shift gears as your company’s revenue grows. 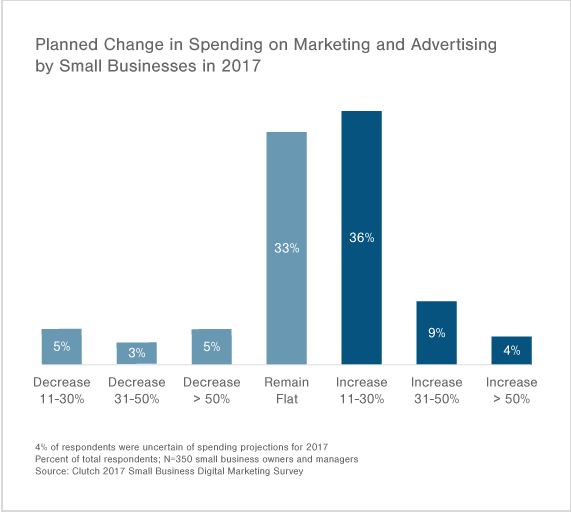 In 2017, approximately half (49%) of small business owners plan to spend more on marketing and advertising in 2017. Of the small businesses that plan to boost their marketing budgets, roughly a third (36%) plan an increase of 11-30%. Matt Ham is the founder and CEO of Computer Repair Doctor, an electronics repair company with six locations across the southern United States. He believes a positive outlook is an essential component of any small business’s success. “I think that most people, especially small business owners, will be optimistic, since their business reflects them and the work they're putting in,” said Ham. Optimism primes small businesses to be more willing to take risks and bet on their own success. Of the small businesses surveyed, over half (59%) expect to see revenue growth in 2017. A quarter (25%) of small businesses expected their growth to remain approximately flat, while relatively few reported uncertainty or anticipated a decrease in revenue. As you prepare to allocate a larger budget, thorough knowledge of best practices will also boost confidence and optimism. 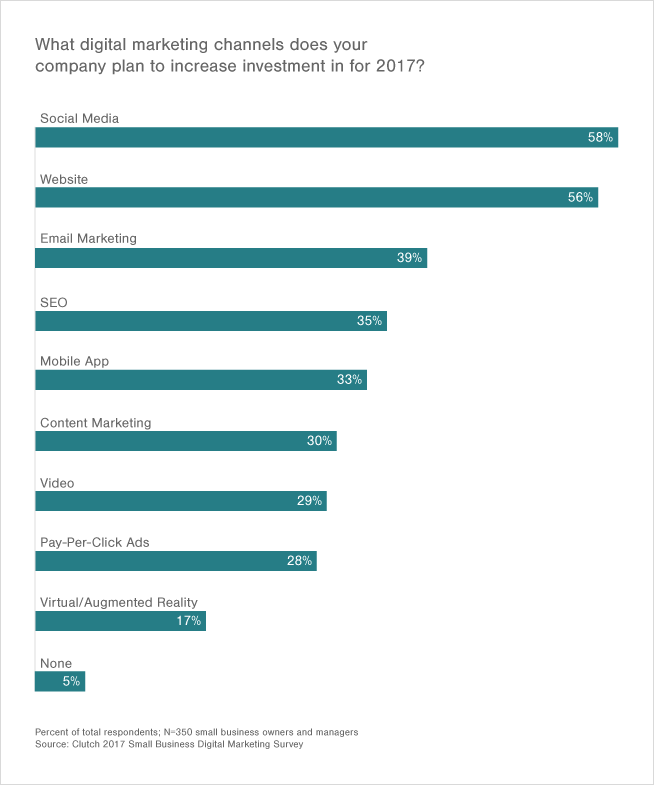 With digital marketing strategies emerging as increasingly essential components of the marketing mix, where are small businesses planning to invest their expanded marketing budgets? Among digital marketing options, small businesses are most eager to increase investment in social media (58%), a website (56%), email marketing (39%), and SEO (35%) in 2017. Regardless of whether a small business has found success through traditional marketing, having a strong digital presence should be an essential element of every business’s marketing plan. Below, Clutch investigated two key digital marketing trends you can expect to see in 2017. The ubiquity of social media make it a key starting point for small businesses. “At the end of the day, it's much cheaper than any other form of advertising, and it gets very good results,” said Parks. Nevertheless, Parks cautions that the days of organic reach on social media are over. Small businesses preparing to invest more in their marketing and advertising need to dedicate a portion of their marketing budgets to promoting posts on various social platforms, even if it means producing more focused posts less frequently. “Many don't realize that every social media post, especially on Facebook, should have money behind it,” said Parks. Luckily for small businesses, putting money behind a social media advertising campaign doesn’t have to break your budget. In an explanation of how a Facebook campaign functions, Facebook suggested $15 as a reasonable budget for a single ad. Beyond social media, SEO remains a powerful component of a robust marketing strategy. Among SEO strategies, Clutch found that 52% of small business owners surveyed prioritize investing in improving their ranking in local searches. “It's the equivalent of coming across a brick-and-mortar store,” said Meddin, whose ecommerce business was rebooted from an Atlanta-based restaurant franchise. Overall, the shift toward digital over traditional marketing strategies means that small businesses can now spend less while getting traction that they can track granularly. In the process of expanding his marketing operations, Ham, of Computer Repair Doctor, recently decided to bring in a marketing manager for the first time to help him manage the marketing projects he has always executed himself. Although Ham has worked with agencies in the past, he admits that he’s a demanding client with strong opinions and high expectations. He hopes that bringing a marketing manager onto his team will allow him to train a collaborator in the ins-and-outs of Computer Repair Doctor’s business to a degree that a short-term commitment with an agency can’t provide. “If we can get someone to do something 80-90 percent as well as us, and we can afford them, then we should hire out and focus on something else,” said Ham. Ham isn’t alone. Of the 350 small businesses surveyed, 335 employ in-house digital marketing staff. Many small businesses (49%) rely on 1-2 employees to produce digital marketing campaigns ranging from social media marketing, SEO, content marketing, email marketing, a website, or a mobile app. 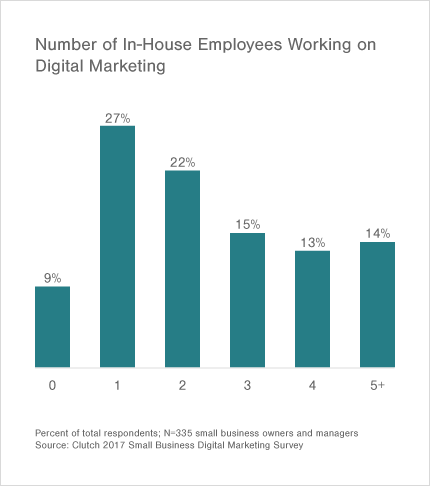 Roughly a quarter (28%) of small businesses employ 3-4 digital marketing employees, while only 14% of small businesses reported that they employed 5 or more digital marketing employees. 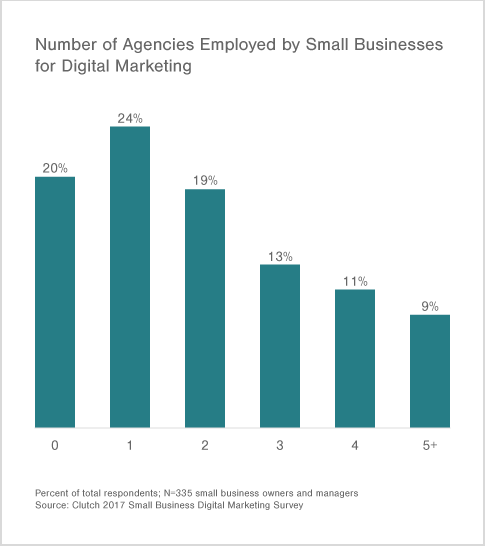 Despite widespread interest in hiring in-house marketing staff, 80% of small businesses surveyed do work with one or more digital marketing agencies, with the bulk (43%) working with one or two agencies. In some situations, hiring a full service agency may be the equivalent of a full time marketing employee’s salary. This route may prove to be worthwhile if you are seeking the most cutting-edge strategies or need help with a thorough overhaul of your brand’s story. In other cases, your in-house marketing team may be so successful that they need help keeping up with the demands of a labor-intensive content marketing strategy. Scripted CEO Buckley has built his agency to provide the consistency that is the key to any successful content marketing strategy. Rather than providing a full-service marketing consultancy, Scripted is designed to plug into an existing in-house staff. Scripted aims to elevate an in-house marketer to an editor-in-chief role, or to boost the productivity of in-house content marketers by replicating their successes on a bigger scale. For small business owners who are curious about working with an agency but may be strapped for cash, The Media Captain’s Parks suggests that they consider hiring an agency for an hour or two of consulting. You may have already encountered virtual reality (VR) or augmented reality (AR) through Google Cardboard or Pokémon Go. But even if you have some familiarity with these new technologies, you may not have realized that they may become increasingly common components of your marketing strategy in the future. Although AR and VR seem to evoke science fiction, small businesses are already finding creative ways to include them in the marketing mix. Surprisingly, Clutch found that 17% of small businesses are interested in investing AR and VR in 2017. Vlad Korobov is co-founder and COO of Live Typing, a web and mobile app development company. In his experience, companies use AR and VR to enhancing their reputation for being modern early adopters--not for a specific marketing function. Most requests he’s gotten have come from the gaming and entertainment industries, along with the scientific community. For example, a fruit producer could take customers on a virtual trip to the farm where the produce was grown and harvested, or on its journey to the store. Hubspot has predicted that 2017 will mark a milestone for video, which is expected to account for 74% of all Internet traffic. 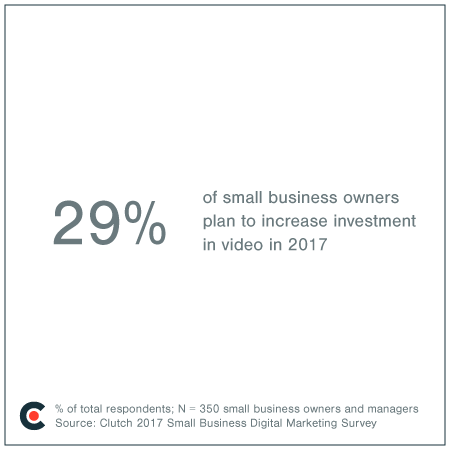 Among the small businesses surveyed by Clutch, 29% plan to increase investment in video. At The Dessert Place, Meddin has recently been exploring Instagram stories, a Snapchat-like feature that allows Instagram users to share short, ephemeral videos with their followers. In January, TechCrunch reported that Instagram stories were rapidly eclipsing Snapchat’s influence. At Sprout Marketing, an article about machine learning and artificial intelligence (AI) has been making the rounds among Williams and her team. Machine learning is a type of programming that allows computers to adapt when exposed to new data and is enabled by AI, which allows computers to develop without human interference. In early 2015, Google introduced RankBrain, a tool that aids online queries with machine learning and AI. If you’re planning to expand your marketing and advertising budget this year, it’s as important as ever to make every dollar count. Every small business owner would probably like to hire an agency to develop high quality social media and blog content, have a team of brilliant marketers on staff, and wow customers with a custom virtual reality experience. Even without a bottomless budget, there are a range of creative ways to learn from and apply top-shelf strategies. When it comes to social media, the days of being able to rely on purely organic reach are over. Luckily, costs associated with paid social media marketing are still unbeatably low—as little as $15—so even a small investment will punch above its weight. Rather than spreading your budget across a never-ending array of social media platforms, focus on the one or two platforms that best serve your brand. Although it’s not the buzziest topic on the list, investing in your small business’s SEO remains essential to success–and with no additional spend except staff time, remains one of the most accessible. SEO can help ensure that when consumers are looking for a product or solution, your small businesses appears at the top of the results. Despite the fact that newly-formed or bootstrapped small businesses likely won’t be able to invest in a full partnership with an agency, it doesn’t mean that agencies’ insights are completely out of reach. Even a few hours or sessions of consulting with an established agency can help ensure an small business’s marketing and advertising plan doesn’t go off the rails. Doing so can support and extend the work of in-house marketing staff, at a fraction of the cost. Augmented reality and virtual reality will undoubtedly continue to captivate the public imagination, but you don’t actually need costly equipment and a team of developers to add an interactive element to your marketing mix. A low-cost solution such as an Instagram story shot on an iPhone or a Facebook Live chat with your small business’s founder can provide a similar yet low cost opportunity give customers an opportunity for authentic interaction. If you have any questions or feedback regarding these results, please contact Michelle Delgado at [email protected].